Can you build a face rig in one day? That's what I set out to answer with this 3D Appeal Makeover! Thanks to the one and only Galen Chu, Senior Supervising Animator at Blue Sky for this kind recommendation for my work! "Dave Gallagher is simply the BEST! He is an amazingly talented animator, modeler AND rigger. But his real talent is in taking a 2D design and translating it into a 3D model. All too often a 2D design is "cheated" for a specific angle or even a pose. Dave's genius is in his ability to bring all the elements from all the awesome but cheated drawings together to make a cohesive appealing 3D character. And because of his background in character animation, Dave also has a unique way of creating appealing articulate facial rigs that are very user-friendly. He seems to have a knack of finding the essence of the character and capturing it in the 3D model and in the facial expressions he creates. Dave's work in creating appealing characters have graced Blue Sky's films for many many years. 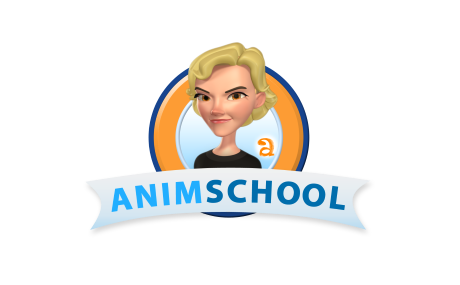 Dave has had a tremendous influence on infusing "appeal and character" in many of the characters in Blue Sky's films"
AnimSchool Beta Classes -- starting today! We're so excited here at AnimSchool. Our beta classes are starting today, with 24 students. That can only mean AnimSchool is closer to launching later this month. What an amazing collection of talent we have at the school! Stay tuned!